Dwarfed by the 200-tonne gantry crane, close to one hundred people from ITER India, the ITER Organization, the European Domestic Agency, the contractors who contributed to the building construction, and members of the media attended the inauguration ceremony. 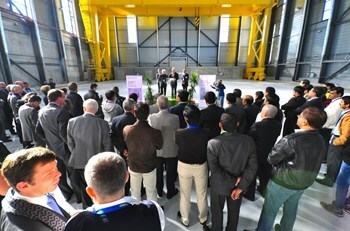 In June 2013, an unusual ceremony was held in the southeast corner of the ITER platform. Coconuts were broken, the meat was shared between the participants, and the blessing of the lord Ganesha (the "Remover-of-obstacles") was called upon this small stretch of bare land—the approximate size of a football field—that had been made available to the Indian Domestic Agency for the construction the Cryostat Workshop. Now, one and a half years later, the site of the ceremony has changed dramatically, with an impressive 110-metre-long, 44-metre-wide and 27-metre-high building now occupying the better portion of the parcel. The Cryostat Workshop, completed in February 2014 and handed over in August, was inaugurated last Friday 21 November. "This building will play an essential role in the making of the ITER Tokamak," said ITER Director-General Osamu Motojima as he addressed the many guests assembled under the high roof of the Workshop for the inauguration. "It is here that the ITER cryostat will be assembled before its integration into the machine." The construction of the Cryostat Workshop, he added, "is a beautiful example of dedication and efficiency in international collaboration." Procured by the Indian Domestic Agency, contracted to the Indian industrial giant Larsen & Toubro that is also responsible for manufacturing the cryostat, and built by the French company Spie Batignolles, the building was finalized in just nine months. 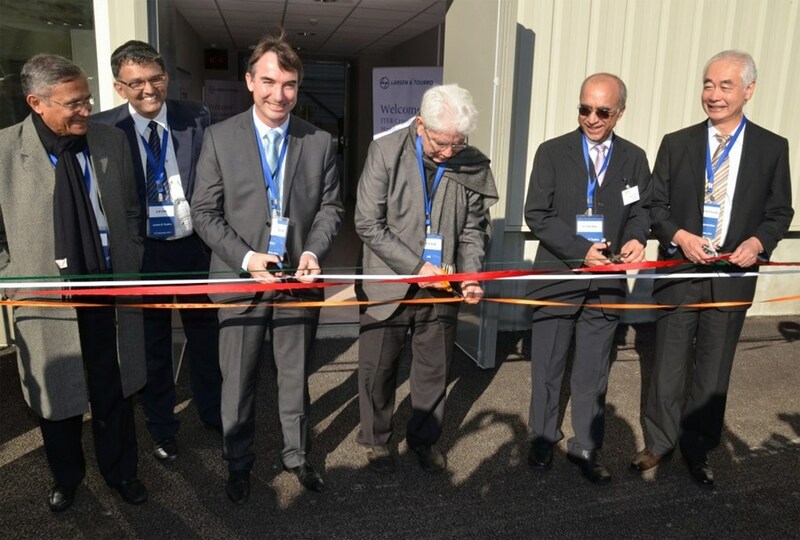 The symbolic ribbon at the entrance of the Cryostat Workshop was cut by Benoît Moncade, director-general of Spie-Batignolles; Pr. Predhiman Krishan Kaw, Indian delegate to the ITER Council; M.V. Kotwal, president of Larsen & Toubro's Heavy Engineering Division; and Osamu Motojima, Director-General of the ITER Organization. Looking on are Dhiraj Bora, director of the Indian Institute of Plasma Research and former ITER DDG and Ganesh Iyer, head of the ITER Project at Larsen & Toubro Ltd.
M.V. 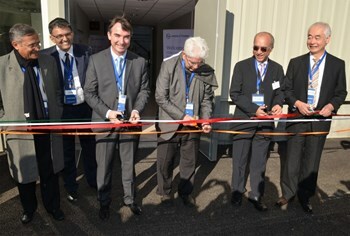 Kotwal, the president of Larsen & Toubro's Heavy Engineering Division who had travelled especially from India for the inauguration, stressed the "spirit" that presided over the construction of the building and, more broadly, over the collaboration between his company and the ITER Project. He also noted that that work was performed without one single accident or injury. "It is not only technology that makes things happen," he said. "It is the commitment, the human emotions put together. Let us all remember that by harnessing fusion energy we are working towards the unique goal of changing peoples' lives." However distant this goal may be, it is now attainable. "One day," mused Predhiman Krishan Kaw, the founding father of India's Institute for Plasma Research and a member of the Indian delegation to the ITER Council, "we will all gather again to inaugurate the ITER Project," the decisive step towards providing mankind with unlimited energy. "Success is achieved through partnership," concluded Benoît Moncade, the Director-General of Spie-Batignolles. "Our sessions in Mumbai with Larsen & Toubro were intense and we were impressed by the company's professionalism." As the "jewel box" was being inaugurated, the 30 x 30-metre, 3,800-tonne "jewel" was taking shape in Larsen & Toubro's Hazira factory, some 6,500 kilometres from the ITER site. "The elements of the base section, which will be the first large component to be integrated into the machine, are now 50 percent completed," confided Ganesh Iyer, the head of the ITER Project at Larsen & Toubro Ltd. "Delivery to the ITER site should begin this summer. One year from now, you will see a lot of activity in this building." Click here to view more images of the inauguration or here to watch a three-minute video of the event.